For the birdwatcher two of the main attractions of Islay in Autumn are the Geese and the Chough. 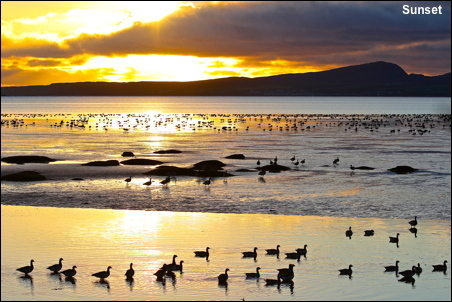 From mid October more than thirty thousand Barnacle Geese arrive from Greenland. After feeding in the fields during the day they descend onto the estuary for the night and provide one of the greatest bird spectacles in Europe.